Posted on Wed, Feb 22, 2012 : 12:42 a.m.
EVANSTON, Ill. -- Matt Vogrich never knows when his number might be called. The Michigan basketball team's reserve guard has once again been relegated to spot duty this season, averaging 10.3 minutes per game. He may go stretches without any consistent playing time, or, he may be asked to heat up in a hurry if the team needs a spark. Fortunately for Vogrich, Michigan needed a spark Tuesday. And fortunately for Vogrich's family and friends, the junior guard came through. "It was great (to play well) here," Vogrich said following Michigan's 67-55 overtime win over Northwestern on Tuesday. "My AAU coach was here, I had a lot of friends and family here, too." Michigan coach John Beilein and the Michigan bench celebrate during overtime of a 67-55 win at Northwestern on Tuesday. Vogrich played high school basketball at Lake Forest (Ill.) High School, 21 miles north of Northwestern's Welsh-Ryan Arena. The 6-foot-4 junior broke ex-Wolverine Rob Pelinka's scoring record at Lake Forest from 2005-09 and was an all-state performer as a senior. He reminded many locals why Tuesday. With Evan Smotrycz, Jordan Morgan and Blake McLimans in foul trouble early, Michigan was forced to go small, and Vogrich reaped the reward. The junior hit a pair of first-half 3-pointers and handed out two assists in 10 early minutes, helping Michigan stay in the game early. In the second half, his 3-pointer from the corner with 8:43 to go pulled the Wolverines back within a point, and effectively brought the Evanston-based Michigan cheering section to its feet. Vogrich finished with nine points, two assists and a blocked shot in 18 minutes. "He's been a big part of this little surge we're having right now," Michigan coach John Beilein said of Vogrich. "You've seen all year long that we've struggled with our bench play. "And we need that. He's done a good job." During Michigan's current four-game winning streak, Vogrich has gone 9-for-13 from 3-point range, providing a spark off the bench that hasn't been there for most of the season. Known as a 3-point specialist, Vogrich entered the Nebraska game on Feb. 8 shooting just 21.2 percent from behind the arc. But thanks to his recent hot streak, he's jumped up to a more respectable 33.3 percent on the year. Michigan has the capability of putting five 3-point shooters on the floor at once, and with a confident Vogrich, they now have six. Just in the nick of time, too. "We've got a ton of shooters on this team, and we're making big shots," Vogrich said. "But it's more about getting wins at this point. "We're so close to our goal, and we're right in the Big Ten hunt." Michigan's Jordan Morgan battles for a rebound against Northwestern. Morgan and Smotrcyz both collected two fouls six minutes into the game, and as a result, sat the final 14 minutes of the first half. Beilein then went to McLimans, who didn't last much longer himself, eventually picking up two fouls with 5:17 to play before the break. With sophomore forward Jon Horford at home still recovering from a foot injury, Beilein was out of options, eventually inserting 6-foot-6 sophomore Colton Christian into the game at center. "They drove it at us and drove it at us and the officials called it really tight," Beilein said. "But they were the right calls. We just hung in there and hung in there. Jordan Morgan is a big presence in there, and that hurt us." Morgan played two minutes in the first half, Smotrycz played four. As a result, the Wolverines entered the break with just two 2-point field goals, and a rebounding deficit of 10. Northwestern also out-scored Michigan 16-2 in the paint over the first 20 minutes. The Wolverines bounced back, though, out-rebounding Northwestern 25-18 during the second half and overtime. Northwestern senior forward John Shurna, who leads the Big Ten in scoring, was honored before the game for becoming Northwestern's all-time leading scorer. The pregame ceremony didn't translate, though. Shurna never really caught fire, going just 6-for-16 from the floor with 14 points and two turnovers. "It was multiple guys guarding him, we did some different things," Beilein said. "I had (Kevin) Pittsnogle at West Virginia, a tremendous player, and you cannot do certain things (with versatile big men). "We tried to do some things to not allow him to feel comfort, even in the NBA (3-point) range." Michigan and Northwestern played to an overtime game for the second time this season, with the Wolverines winning both. Michigan is now 61-35 all-time in overtime, and an impressive 25-15 in road extra-session games. Against the Wildcats in overtime, Michigan is 5-3 all-time, with wins in each of the last three instances. Freshman point guard Trey Burke finished with four assists and is now seven shy of the school's single-season record for assists by a freshman. Gary Grant set the mark with 140 in 1984-85. Wed, Feb 22, 2012 : 5:55 p.m. Wed, Feb 22, 2012 : 3:56 p.m.
matt vogrich has been stalwart. he's made his shots----been effective on defense----scrambled to gather rebounds. next season----with no stu/zack---vogrich will have to play major minutes. it's really too bad that he didn't redshirt his freshman year. the extra year of eligibility would have been super for him and the program. Wed, Feb 22, 2012 : 3:31 p.m. I was half expecting Ben Cronin to be suited up and out on the floor, bad hip and all. (Did anyone see Rosenberg's article on him last weekend? I almost cried). That was a great game, a great gut-it-out, and more tremendous leadership from Burke. I loved Gary Grant, and Burke has entered rarefied air there. Wed, Feb 22, 2012 : 1:38 p.m. Despite the OT win, this game really highlighted Michigan's weakness on the front line right now. Beilein will almost never put Smotrycz and Morgan on the floor at the same time. And with Horford still out, when both of them get in foul trouble, things get really ugly for Michigan. McLimans was awful in his 1st half stint last night. He didn't score, got few rebounds, and played poor defense. At times, we basically had 5 guards on the floor size-wise. It's a minor miracle we were only behind by 7 at the half. I believe sometimes Beilein needs to take a chance and put a guy with 2 fouls in for a while to avoid getting further behind. The good news is we won and that next year Michigan will not have this size problem. 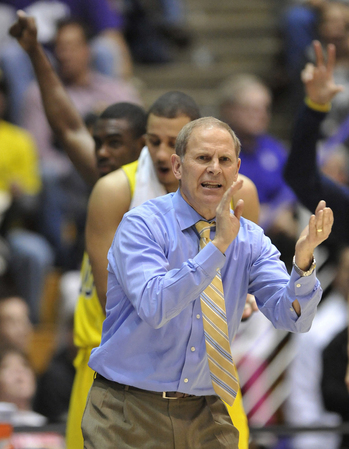 Wed, Feb 22, 2012 : 9:26 p.m.
Just let Beilein do his thing. He's winning. Chances are good that he knows more about basketball than any of us. Did I mention he's winning? Wed, Feb 22, 2012 : 1:56 p.m. I agree, Beilein's foul = bench policy seems to hurt us sometimes. It is very, very rare that we lose a player in the second half due to fouling out of the game. Which only tells me that he needs to gamble a little more to let our bigs keep playing, especially in the first half. Morgan only plays 2 minutes in the first? Ridiculous. Wed, Feb 22, 2012 : 1:34 p.m. Wed, Feb 22, 2012 : 12:57 p.m.